Chicken curry was one of the recipes we tried at our first “International Food Night” with the Tiny Tasters. I was a little worried about how the kids would like chicken curry, but to my surprise the kids were really receptive. My parents were born and raised in Sri Lanka where curry flavors are used similarly to Indian food. 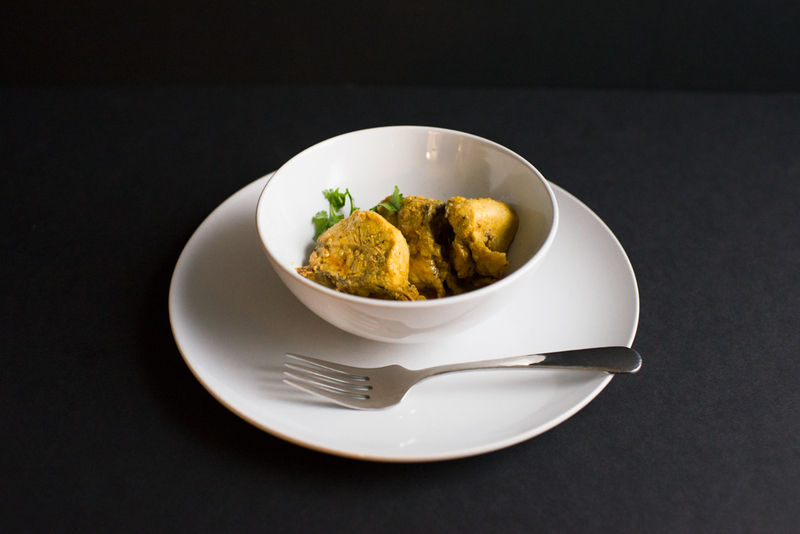 My mother came up with this recipe which uses very mild curry flavors and coconut milk. The curry takes on a yellow color from turmeric, a spice used in many South Asian and Middle Eastern dishes. Turmeric is a golden colored spice which has gotten a lot of attention recently for its anti-inflammatory and anti-cancer properties. It has also been investigated for benefits in Alzheimer’s disease. It’s widely believed that the commonly used spice may be one of the reasons that Alzheimer’s disease incidence is so low in South Asia. Knowing all of these health benefits, I often put a pinch of turmeric in stews, chili and other sauces. See our post on Food Passports to encourage kids to try new ethnic foods. I made this for an International Food Night and the Tiny Tasters loved it! Heat oil over medium heat in a large skillet. Fry onions until soft and just starting to brown, about 2-3 minutes. Add ketchup, curry powder, chili powder, cinnamon, and turmeric until spices are slightly roasted. Add garlic and ginger and cook an additional minute. Add chicken and cook until slightly brown. Add salt, pepper and coconut milk. Simmer in coconut milk and spices for and additional 4-6 minutes. Add additional salt to taste. Expose new eaters to curry flavors. Remove some of the chicken and flavorful broth (consider adding chili last so it's not too spicy for your baby). Purée, hand mash, or smash with a fork some of the the chicken into rice, potatoes or other grains. 6 servings (double for a great "Cook Once, Eat Twice Meal"